Sooho forces a meeting with his family and Mrs. Yoon goes makjang. Sooho has Eunsoo sit down on the chair even as her breath manifests in fog showing how cold it’s in Korea. Eunsoo is so surprised that the first thing she asks is if Sooho didn’t go out to meet Bitna’s friend. Sooho pulls out a throw blanket to cover Eunsoo’s legs as he smiles that he has no time to meet with other people when he doesn’t have enough time to spend with Eunsoo. But, Sooho true to his character pushes on. He gets on his knees and pulls out a box with a diamond ring. Explaining that he loves Eunsoo too much to not ask her to marry him, he asks her to marry him. Eunsoo frowns and asks if they can’t just date and not marry. Sooho finally frowns and asks if Eunsoo doesn’t want to marry him. Eunsoo stands up and pauses. She haltingly explains that they can date with just the two of them but marriage is an issue where both families must agree. She adds that she doesn’t think that Sooho’s family would like her. Sooho protests that his parents will like her; his mom likes everyone that he likes. But, Eunsoo only shakes her head. She notes that she’s not prepared and Sooho backs off graciously. 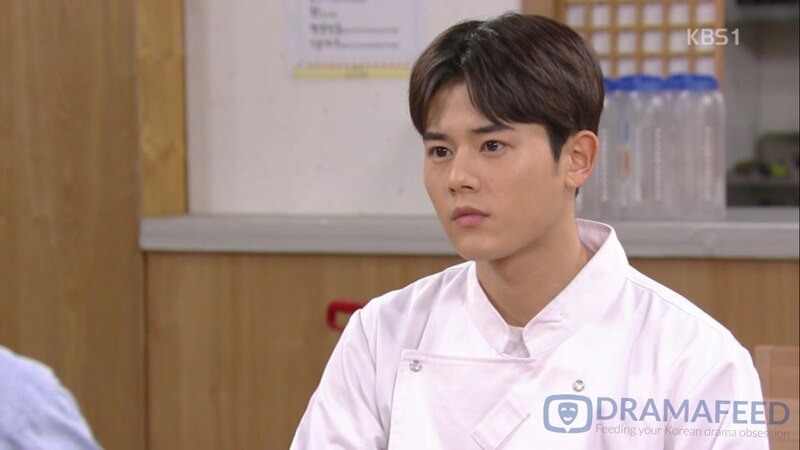 He forces a smile and orders that Eunsoo eat dinner with him and walk him home for his troubles. Sooho’s game plan is to ask Eunsoo to walk in with him. Eunsoo refuses. However, she doesn’t leave fast enough because Mr. Yoon, Bitna and Soohyun arrive. Suddenly, the whole family is in the living room. Sooho announces that he wants to marry Eunsoo. Everyone is surprised but no one is smiling or welcoming. Mrs. Yoon asks Eunsoo if she agrees with Sooho. Eunsoo only apologizes for visiting unexpectedly and causing stress. Sooho stops her saying that they aren’t done talking. But, Mr. Yoon agrees with Eunsoo. He dismisses her saying that they can speak again. Eunsoo dutifully gets up and leaves with Sooho following. She snaps at him that she can walk home alone. Sooho doesn’t want to let her go. So, Eunsoo asks what he’s thinking trying to push it through like this. She notes that no one seemed to like her. Sooho just smiles that everyone was shocked; they will come around. Back inside, Soomin repeats Eunsoo’s name wondering where she heard it. She remembers the scene at the police station and unconsciously flinches realizing that Eunsoo is Eunho’s sister. Meanwhile, Mrs. Yoon sighs in exasperation that she doesn’t approve of the wedding. The girl is bad whether you look at her age, job or family. Soomin sighs that her brother is not better other than having the luck of a rich father. Mrs. Yoon insists that Sooho is still young (uh 28/29 y’all too young because it’s only the age where you would have graduated grad school and or worked your way up into management) and can end up the CEO of a company. Mr. Yoon asks for other opinions. Soohyun adds that he thinks that Sooho isn’t ready for marriage since he hasn’t gotten financially independent. But, Soonjung declares that she supports Sooho. She explains that one of the worst things is not being able to get married and creating your family. Soonjung looks pointedly at Mr. Yoon and asks if she wouldn’t already be married with her own family had he not disapproved her wedding when she brought home a guy at 22. Mr. Yoon dismisses the family and goes into his room. Mrs. Yoon literally runs to follow and insists that this wedding cannot happen as Eunsoo is her friend’s daughter. Her friend is a widow barely getting by with a small dry cleaners. Mr. Yoon glares at his wife and asks why she’s so materialistic. She sniffs that it’s the same for every parent to want their child to marry someone amazing. At the same time, Eunsoo gets home. She quietly goes into her room to cry. Only Sooho is gleeful. He goes home and finds his sister in the kitchen. So, he joins her for a cup of water and cannot help laughing. As a side matter, Bitna waits for Sooho to yell at him for subbing his friend in the matter of showing her friend around. Sooho just laughs and thanks her as she gave him the opportunity to propose to Eunsoo, which he wouldn’t have had the chance otherwise. In the morning, Mrs. Yoon pulls Sooho aside to tell him that his curfew moved up to 11pm. She doesn’t care that it only gives him one hour after closing to come home. He doesn’t need time to do anything and he can stop dating Eunsoo because she doesn’t approve. Mrs. Yoon decides to take matters into her own hands. She throws on a garly blue fur coat and visits Yeonmi. Immediately, Mrs. Yoon declares that she’s sorry but she cannot approve of the marriage. Of course, Yeonmi is blindsided and has no idea what Mrs. Yoon is talking about until Mrs. Yoon snaps that Sooho is her son. She wonders out loud bitterly why Eunsoo didn’t tell Yeonmi about coming to the Yoon residence to ask for permission to get married. Mrs. Yoon goes on to say that Eunsoo should have known better since she’s a full year older than Sooho! How could she think of dating someone a WHOLE year younger? She insinuates that Eunsoo only dated Sooho because he knew about her family. Yeonmi has had enough. She interrupts to snap that Mrs. Yoon needs to stop. Just as Sooho is a precious son, Eunsoo is her precious daughter and Eunsoo dated Sooho without knowing about his background. The two women are yelling at this point and Grandma walks in. Mrs. Yoon leaves and Yeonmi calls Eunsoo to drop by after work. Then Eunsoo gets called into Bitna’s office. Bitna’s important meeting is to threaten Eunsoo to give up or she will tell the Yoon’s about Eunsoo’s history. Eunsoo snaps back that Bitna can go tell all she wants as Bitna’s past will come out, too. Meanwhile, Yeonmi tells Grandma. Grandma wonders how such a sweet son could be the child of such a doltish woman. She then laughs and tells Yeonmi not to worry too much as Eunsoo will take care of it. Yeonmi sniffs that Eunsoo already made a mess making Yeonmi gear such unreasonable stuff from Mrs. Yoon. Things get complicated when Bitna’s grandma lurks around Eunsoo’s grandma and her friends during her forced community service again. When one of the friends mentions that a son of a friend is getting married, the topic turns to Eunsoo and how she should get married at her age. Eunsoo’s grandma happily brags that a guy came asking for approval to date Eunsoo seriously and he’s he heir to Yoon Ga Food. Bitna’s grandma rushes to Bitna’s office to confirm the truth. Bitna reassures her grandma that her mother-in-law is completely against the union. Meanwhile, the restaurant has some quiet time so Mr. Yoon calls Sooho over to discuss the recent events. 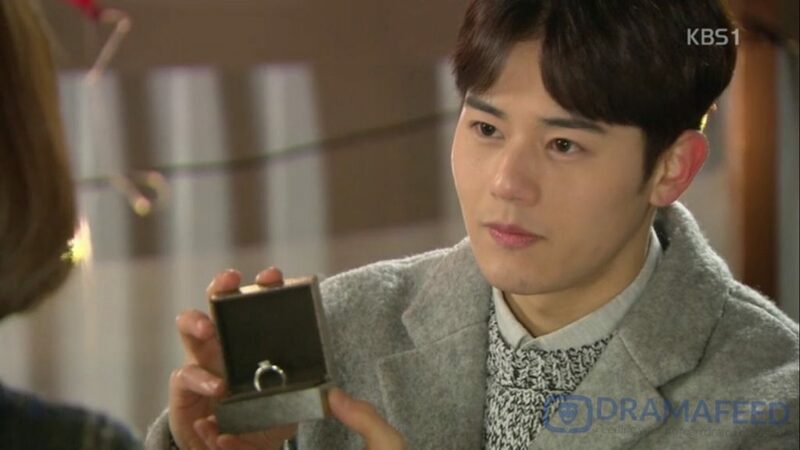 He tells Sooho to think carefully about marriage, which is a life-changing decision. Sooho answers that he doesn’t have to think any more as he loves Eunsoo and Eunsoo is the one who made him feel like living respectably instead of just frittering his life away. Sooho asks Mr. Yoon if Mr. Yoon doesn’t think Eunsoo is a good person. 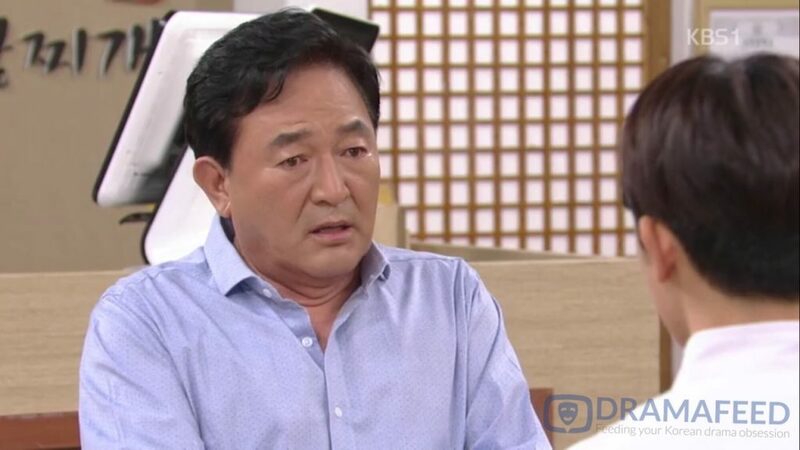 Mr. Yoon sighs that being a good person is different from what he wants in a daughter-in-law. He also muses that Sooho might feel differently when the urgency of his feelings fade away. Sooho doesn’t bat a beat and answers that his feelings might fade but his trust in Eunsoo won’t. He explains that trust is most important and he believes that Eunsoo will always be on his side supporting him. Mr. Yoon loses his words. Did anyone else’s heart just stop at the fact that this naive boy knew exactly what is the most important thing for marriage? Trust that your spouse will always be on your side?! That evening, Eunsoo goes to the dry cleaners to meet with her mom. But, Yeonmi steps out for a moment. At that moment, Mrs. Yoon walks in and announces that she had something to say to Eunsoo. She doesn’t like Eunsoo. She doesn’t like that Eunsoo is both older and has nothing good to show otherwise. She also adds that she thinks that if Eunsoo truly cared for Sooho, Eunsoo would leave him since Eunsoo blocks his future progression just like she took his spot as an official employee in the company. Yeonmi arrives to hear the tail end of this ridiculous tirade and storms yelling at Mrs. Yoon. And, the makjang started. Surprisingly, Mrs. Yoon is spearheading the makjang without any manipulation from Bitna! This is unexpected. I do think that this reaction is helpful for Eunsoo. Eunsoo will know exactly what she’s getting into if she decides to pursue the marriage instead of everything looking good and then life turning to hell when Mrs. Yoon is manipulated by Bitna after the wedding is over. If Eunsoo decides that she can accept the ridiculously hypocritical, rude and ignorant Mrs. Yoon as her mother-in-law, Eunsoo makes an informed decision. Turning to why I thought Mrs. Yoon’s reaction was overboard and makjang. While I had expected Mrs. Yoon not to love Eunsoo as a candidate for her daughter-in-law, I thought that her friendship with Yeonmi would at least make her ponder the decision to disapprove of the wedding on such shallow grounds. I expected that she would disapprove in private but not do the go yell at Yeonmi and Eunsoo in a ridiculous blue fur coat. Also, Mrs. Yoon’s anger seems a bit ridiculous when one evaluates Sooho objectively. He’s around 29, most young professionals that age have gotten into positions of management and he is a guy. It’s more embarrassing that he’s just starting to learn how to be a chef and doesn’t have anything on his resume to brag about. The only way he would get a decent position is if he gets a management position in his family’s company since he neither has a MBA or 5 years work experience like his aged peers. So, what kind of daughter-in-law does she think that Sooho deserves? Still Loving You Episodes 60 Recap by DRAMAFEED | Copy & Paste Guidelines – Always put a link back to the source. Yeah, I was seriously disappointed in Mrs. Yoon. I knew that she likes being superior to Eunsoo’s mom, I knew she had pretentions and dreams of wealth and status, and I always thought her idea of friendship was showing up to brag on herself. But I never thought she would be so vicious and nasty. I’m not sure how she would’ve acted I Bitna hadn’t lit that small fuse. Mrs Yoon always struck me as being smarter despite her air-headed attitude, but this makes me re-assess her. Thanks for recapping. Thank you for commenting and adding your point of view! I thought your description of Mrs. Yoon was right on point having “pretensions and dreams of wealth and status”. I’m usually harsh on the husband’s side parents in these dramas as I recap so I tried to give Mrs. Yoon’s character some distance from my usual ire… but I hated how she seemed so “nouveau riche” and simple. I respect the amazing people who manage to succeed and get financially stable or rich. However, I hate the behavior associated with nouveau riche – the bragging and flaunting. Really, the behavior suggests that they only value money as an end goal when money is just a tool to achieve what you really value in life. Anyways, all my self-control and distance flew out the cafe doors as I watched this episode. Woman needs to calm her makjang self down.